The rarest Beatles record in the world features at Julien’s Auctions music icons sale in Liverpool on May 9. 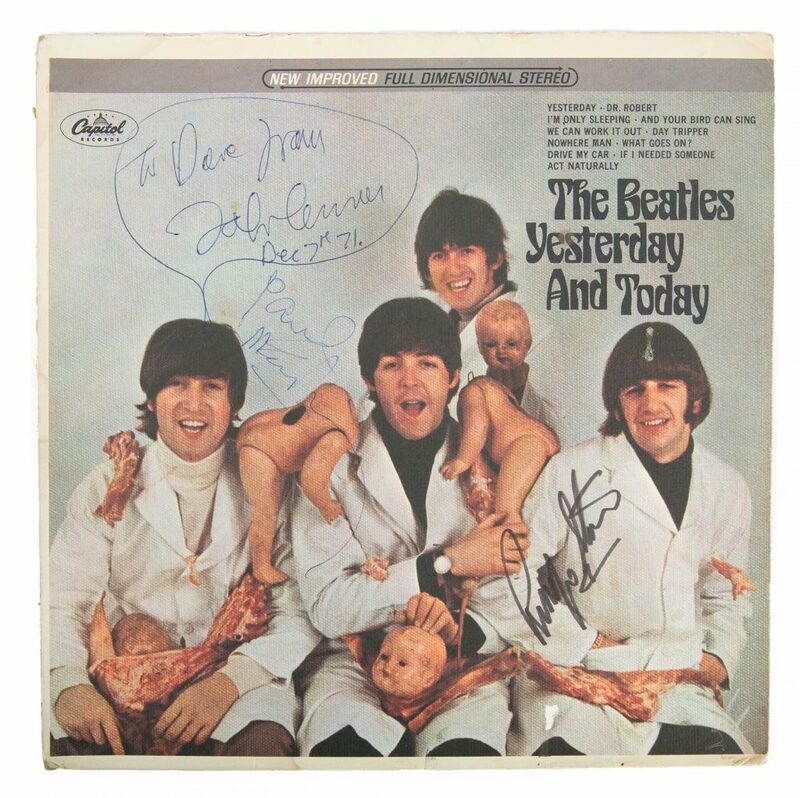 John Lennon’s signed album “Yesterday And Today” (1966), a U.S. First State Butcher prototype stereo example will highlight the auction. Displayed on the wall of his Dakota apartment in New York until he had an assistant take it down and deliver it to the Record Plant where he signed it in blue ink: “To Dave from/ John Lennon/ Dec 7th 71.” it is considered the rarest Beatles record in the world. The recipient was Dave Morrell, a Beatles fan and bootleg collector. “The Butcher” was given in essentially a trade for a reel-to-reel tape of Morrell’s Yellow Matter Custard bootleg that Lennon desired. Lennon filled the blank back of the cover with a drawing depicting a man holding a shovel with his dog in front of a setting sun. The cover also includes autographs by Ringo Starr and Paul McCartney, which Morrell obtained later. This is believed to be the only First State Butcher album bearing three Beatles signatures and is estimated at $160,000-$180,000. The venue for the live and online sale is The Beatles Story Museum in Liverpool. Other top lots include a Beatles signed baseball from their final US concert and John Lennon’s signed guitar strap. Julien’s Auctions will partner once again with The Beatles Story to bring their Beatles and Merseybeat “Memorabilia Day” back home to Liverpool on Friday, May 10 for a Beatlemania event. Fans and collectors are invited to bring in their Beatles memorabilia to have appraised by the experts for free at The Beatles Story’s Fab4 Cafe on the Royal Albert Dock. This entry was posted on Thursday, March 21st, 2019 at 2:59 pm	and is filed under AUCTIONS, COLLECTIBLES. You can follow any responses to this entry through the RSS 2.0 feed. You can leave a response, or trackback from your own site.